There has been a great deal said about the New Bus For London (which hereafter I shall abbreviate to ‘LT’, which is its official, if contrived’ fleet reference). I suppose that the reason that so much more has been said about it than pretty much any other new London bus in the last thirty years or so is because it is a politically-inspired vehicle. It is therefore attracting a lot of comment (much not well-informed) on the basis of whether one favours mayor Johnson or not. Clearly if one is not a Johnson supporter then pretty much anything negative about the new vehicles will be identified and shouted out as loudly as possible. A Johnson supporter, of course, will notice what they choose to perceive as mere niggles and shut up. Most people will be between these extremes, and many won’t actually care about the political origins. It is a bus, and will be evaluated on its merits. Indeed if we stopped to speculate about the political origins of many things that go on around us, I think we’d be pretty disillusioned! What matters is progress, and provided things are moving in broadly the right direction it probably behoves us not to enquire too deeply about personal motives! One of the LTs being tried out on the 38. The smaller upper windows are evident when compared with bus behind. Although the roof is painted white to reduce warming from direct sunlight, the sweeping roof curves much reduce the reflective area (my quick calculations suggest over a third of the reflective area lost). This may not have helped in recent warm weather, but ought to be fixable. 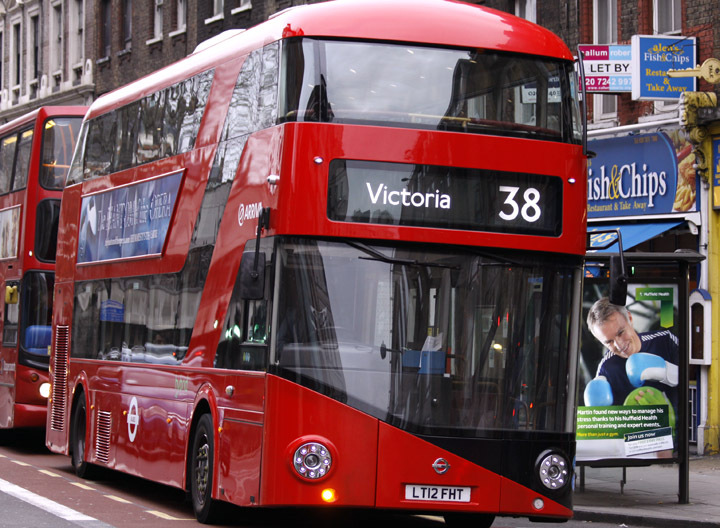 After some excoriating press reports following introduction of LTs on the 24, which coincided with an unusual event called summer, we were invited to feel TfL couldn’t get anything right. I dare say that had the inconveniently warm days happened the week prior to their introduction then the fault would have been noticed and remedied before the buses entered service, but it wasn’t. That is life for you. I commented on the warmth in my last item on this bus. The Commissioner subsequently said the air cooling problem had been fixed and I rode the route again last week from Trafalgar Square to Hampstead and as far as I am concerned it seemed absolutely fine. It was certainly no warmer than on other buses with air cooling units and was cooler than the air outside (which is why I rode it as far as I could). There was, in short, no longer an obvious problem (and I have ridden upstairs subsequently). That did not discourage those who have decided for other reasons not to like the bus from attacking it, not through rational debate about questionable factors (like cost) but for its momentary, press-appealing over-warmth. This is just cheap and unhelpful. I have already reserved my view about these buses on necessity grounds, but if I have a reason to comment on them it won’t be about a short-term technical glitch, which until there is evidence to the contrary is what it seems to have been. Having said that, air coolers are not complicated bits of kit (a chiller unit, air blower, thermostat and so on, just as found in many cars these days, so it is disappointing to find them to be faulty and allowed to become PR disaster). I now turn to the perception of that middle-ground of people, the general public, to see what they think about the vehicles. I think they are a more reliable barometer of the LT’s attributes (I very nearly said thermometer). TfL undertook some research into passenger reaction to the LT that was completed in June 2012, in time for any significant views to be accommodated into the production vehicles (which are not quite the same as the prototypes). One always needs to deploy a huge amount of caution when looking at market research reports, but on the basis it was conducted by someone reputable one can generally work out what trends are or are not telling one, and of course the precision-to-one-percentage-point numerical backdrop is utter tosh (one of my more technical explanations). If one large number is double another large number that tells you something. If one small number is double another it is probably statistically insignificant. I shall therefore ignore quite a lot of the report and just go for the things that real people seemed to have clearly differentiated views about. More people strongly liked the ‘overall design and environment’ of the LT than a ‘conventional bus’ (ie the other buses on the 38). Numbers were 35% to 11% or in ordinary money a 3:1 ratio. The seating on the LT was regarded as satisfactory by a greater proportion of people than on the ordinary bus. In many cases the scores were fairly close to the ordinary bus, but the point is it was regarded as better on all of the six attributes that were looked at. Closer examination of the seating comments observes that more than double those asked thought the LT seats were ‘very comfortable’ compared with the ordinary bus. This was also echoed by those commenting on ease of getting in or out. Bizarrely, respondents thought that the LT provided more satisfactory personal space (whatever that means). A ratio of 7:1 felt strongly about it! Next time I travel on the vehicle I will be trying to think through why this is. The researchers picked up that passengers really do NOT like rear facing seats. Curiously, though, they found that passengers on the LT much preferred the execution on the LT than on other buses that have this arrangement. Again, I shall be deliberately testing this out to see if I can work out why. In terms of spaciousness there was not much to choose between the LT and other buses. All I can find to say on this matter is that of those who held strong views, more felt it was ‘very good’ on the LT than on the other type (ratio between 2:1 [upstairs] and 3:1 [downstairs]). Vibration and noise was perceived as being much better on the LT, a score of about 89 for the LT compared with 68 on normal bus. Those who made their observations strongly thought it was hugely better, between 10:1 and 16:1 depending on attribute. Lighting offered an ambiguous result, not helped by the research being done in summer when relatively few passengers had experienced the lighting. Temperature and ventilation (I’m not sure passengers would be adept at differentiating these) was not as good as on a conventional bus. This was picked up as an issue but the researchers did comment that for a while the system had not been working so that might have affected the results. Curiously, of those who held strong opinions, more thought it was better (by 5:1 as well). Results could also have been affected by weather changes during the survey period. In terms of those feeling safe, the largest score was ‘extremely satisfied’, beating the conventional bus 2:1. Respondents were asked what altered features they would like to see. 60% were satisfied with the design as it was. 13% wanted improved ventilation, 7% wanted improvements to the space, 6% improvements to windows (more/larger but non ventilation related), the remainder were a range of issues none scoring more than 2%. I offer these results for what they are. As far as I have been able to tell, none of the suggested changes have been made except, as TfL has advised me, a modification to the wheelchair bay as the result of suggestions made. Some of the other suggestions may have been impracticable, or mutually exclusive, but perhaps if there had been just a little more development time then production vehicles might have benefited. As it is, there is a nagging suspicion the political timescale over-rode everything. Nevertheless on the basis that the research has been professionally done the results seem to me to represent a design that could hardly be described as a bad design. I dare say if I had been responsible for the research I would have preferred the LT to be compared against more than just a single alternative vehicle and would probably have asked a few more questions. Perhaps about the platform and the conductor (both thought good by users, but not in the context of how much they cost!). Nevertheless if the passengers are telling us that taken in the round the LT is a better bus than its predecessor, I would not lightly dismiss it. It is called evidence! I didn’t really pick up on any questions about the outside: odd given the effort put into it. So, other passengers feel (as I do) that from the user point of view it isn’t a bad bus, whatever the motivations and the cost. Won’t it be interesting to see the mayoral candidates waffling their way though demands to know if the buses are going to be got rid of cometh Their Glorious Rule? This in no way means I am not exceedingly interested in the long term financial justification for these vehicles, for I am. I am also interested in the new contractual model, where TfL owns the vehicles rather than the private operator. This shifts the commercial risks around a bit and presumably affects the value-for-money equation of outsourcing bus services in the first place (but it does apparently reduce financing costs for buses which would otherwise be procured by private operators and paid for by TfL as part of the operator’s service charge). Nor does it mean I think the LTs are perfect, for I do believe that given a little more development time they could have been better. I have said previously I don’t care for the blind rear of the top deck much, but the diagonal alongside the side staircase seems to cut out light unnecessarily. My real beef is that sitting in my favourite seat (top deck nearside) there is a really annoying pillar in my way, spoiling the lookout I have got used to on ordinary buses. I find it very intrusive and it must surely be possible to have designed it out with a little more development time. There are some small adjustments to the handrails I think would be helpful too, and the loss of the vertical pole at the head of the stairs I think is a real mistake. The issue of the conductor and open platform is interesting. Expensive? Yes. Do I like open platforms? Er, well, yes! I’ve used one half a dozen times now and on five of those occasions it was to escape the irritating confinement of a traffic jam. The sixth was when I realized I was going to miss the bus at the stop and positioned myself to get on at the traffic lights at which I could see it would have to stop. I imagine I am not alone (actually the research was a bit vague on this, it should have been sharper, given the controversy). Pundits currently estimate the additional staff costs of providing platform staff are about £62,000 a year per bus and this needs considering against TfL’s attempts to reduce staff from two to one on its rail services and bang on about driverless trains. Compare and contrast! I have now observed the buses in operation without conductors; in case anyone doesn’t know, the rear door then becomes a powered door opening and closing with the others. However there is no explanation on the rear platform about this mode of operation so someone coming down the stairs before the bus reaches a stop and finding the platform closed is now left in doubt about whether they can get out there or should move to the middle doors. I think there needs to be some kind of indication of what is going on when the platform is unmanned. Whether there should be some kind of indication on unconductored buses for boarders is perhaps less important, but might as well be thought about at the same time. Not a perfect bus, but it isn’t a bad bus, and that is coming from its users, not the Evening Standard or others with an interest in using it as a political lever. I have also taken the trouble to check out some of the technical claims made about the bus that its detractors do not really even touch on. If you are interested in the technical benefits, then do check out the following link to an Autocar item on the vehicle HERE. Basically it is technically a good bus too. It gets surprisingly high fuel consumption as the engine runs only at its optimal speed when charging up the 75 kWh battery, and is turned off when not needed. The article also makes some observations about cost, and indicates that while it may be high, it does not seem to be outrageously more expensive than than an equivalent hybrid, especially given its better fuel consumption. By the way, I caught Heatherwick (the designer) on television talking about the design issues for the bus yesterday. I thought what he had to say was quite interesting in terms of how someone was trying to accommodate how people actually used the vehicles, given the design compromises that have inevitably to be made. Listening to him I occasionally wondered if those who ‘design buses’ all the time might have lost sight of passengers wants and needs, perhaps considering them just a bit of engineering. One thing is sure though, whatever the future holds for the LT, I think it will influence future bus design for the better. Surely that would be a good outcome?